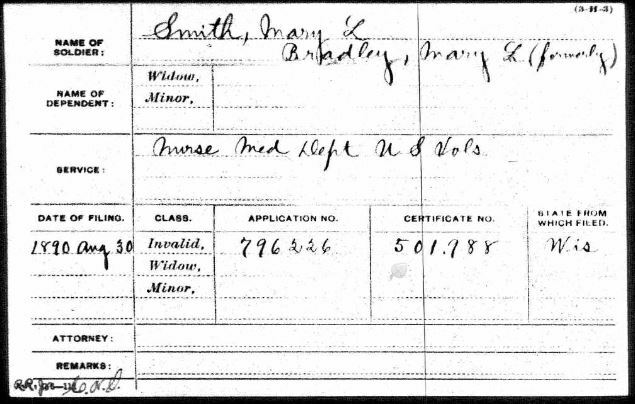 Remarks: Served with her brother Thomas L. Smith in the 10th WI INF. Beloit, Aug. 17, - Mrs. Mary D. Bradley, a resident of Beloit for many years, died today aged 80 years. She was well known throughout the country as one of the greatest Civil War nurses, having been a friend of Clara Barton and others. She served through the entire war, four years, for two years of which she worked without pay. She enlisted from Roscoe, Ill., but spent the last years of her life here. Beloit has lost an old resident in the person of Mrs. Mary Bradley, who ranked high as a nurse during the civil war and was classed with such famous nurses as Clara Barton. Beloit, Wis., Aug. 17, - Mrs. Mary D. Bradley, known throughout the country as one of the great civil war nurses, a resident of Beloit for many years, died today at 80 years. She was a friend of Clara Barton and other famous nurses. She served through the entire war.